“The world has lost one of its brightest stars. Not just queers. Not just die hard Detroiters. The world. Jeffrey Montgomery lost his lover to an anti-gay homicide. Ignored by police as “just another gay killing” he decided to take matters into his own hands. He helped form the Triangle Foundation, now Michigan Equality. For 16 years he came to work, flipped on the coffee and battled injustice. “Jeff help build a team of bold and, dare I say, radical staff, board and interns. His brilliant tactical and communications skills helped build Triangle Foundation into a nationally respected institution feared by the right wing and admired by LGBT groups nationally. When other organizations left Detroit he stayed, despite the challenges that came with that. When others didn’t want us to work against police misconduct and sting operations, he insisted that our movement started by fighting cops and we still were fighting cops. He was one of the top experts on anti-LGBT homicides in the US. He helped elect Jennifer Granholm, Gary Peters, Debbie Stabenow and Carl Levin. He helped end illegal sting operations in Detroit. He won the first lawsuit against a lawmaker for defamation for saying that gays were pedophiles. He created the first gay welcome center at the Superbowl when it came to Detroit. He took on Jerry Falwell, Pope Benedict, Bill Schuette and countless others. And through all this battle, he had the time to raise a generation of activists in MI unapologetically passionate about ending violence, demanding full equality and sexual freedom and pushing back on racist, xenophobic and sexist forces that wanted to roll Michigan backward. 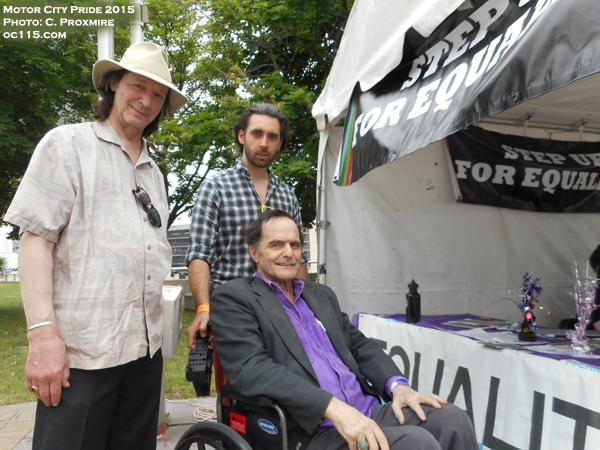 Equality Michigan released a statement saying “Today, Equality Michigan staff, board, and community members are mourning the loss of Jeff Montgomery, the longtime Executive Director for EQMI’s precursor, Triangle Foundation. Jeff’s legacy cannot be overstated. An early activist who was fierce and unapologetic in the face of great hostility, Jeff inspired a generation of activists and successfully pushed for changes many of us never thought possible. “Under Jeff’s leadership, Triangle Foundation grew from a small band of friends in 1991, to a state-wide political powerhouse that took on issues including hate crimes, the reprehensible “gay panic” defense, police misconduct, and the political rights of the LGBTQ community. He has been honored by leaders and organizations at both the state and national levels for his advocacy and his role in advancing civil and human rights. A powerful visionary, Jeff helped to lead not only an organization for LGBT rights in Michigan, but he was also co-chair of the National Coalition of Anti-Violence Projects, he helped with the founding of the Equality Federation, and contributed to many other components of the overall movement for human rights. Montgomery had been in the process of filming “America You Kill Me,” a documentary about his life and the activism he witnessed over the years. Learn more about that project at www.jeffreymontgomery.org. This post will be updated over the next few days with more memories and memorial information. It is presented without advertising due to the subject matter. Please support our sponsors at http://oaklandcounty115.com/sponsorshipadvertising/.